Other versions: PS4; PS3; X360. Sometimes it’s better to let sleeping dogs lie. 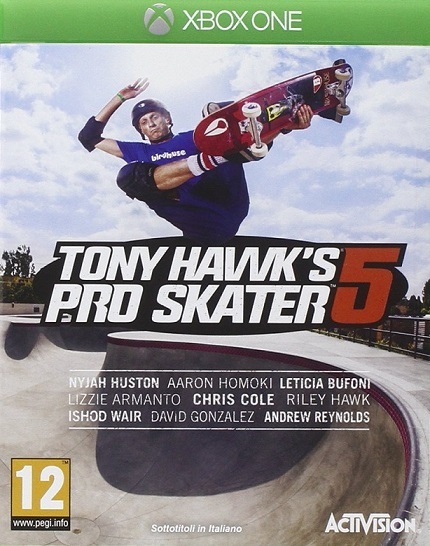 Despite being one of the top-tier series’ of the fifth and sixth generations of gaming, the Tony Hawk games have struggled to gain a footing since Neversoft left development. A poor peripheral-based instalment and a cheap attempt to rekindle nostalgia with a HD remake haven’t helped. 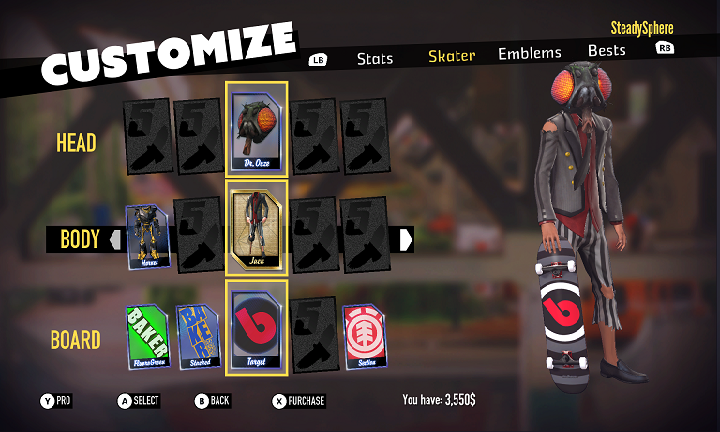 Now, in a crowded year of reboots and sequels, Pro Skater 5 attempts to kickflip the series back into stardom. Instead, it bails, lacking the interesting design and polish of previous instalments. The basic fundamentals remain similar, albeit somewhat stripped. You can flip, grab, grind and manual your way to high scores, chaining moves with the revert. Unlike other games in the series, you can’t change your manual or grind mid-move, and though some functions like the spine transfer are present, it still feels like a simpler version of previous games. The only notable addition is the Slam, which allows you to drop down quickly mid-air. But it can feel clunky: if you opt for one press, it can make chaining grinds a pain, but it becomes unresponsive if you opt for two presses. Either way it’s flawed. The mechanics can also feel rickety, as the controls often fail to register manuals or reverts. 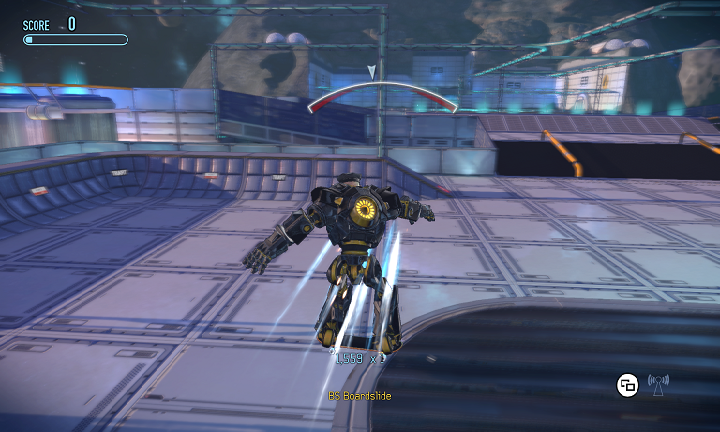 When it works, the skating is perfectly okay, but missions can often be a bit frustrating when the controls lag behind. Speaking of missions, never has a game felt like you’re so literally checking off a list. There are a total of seven levels available, each with Freestyle Objectives and Missions. 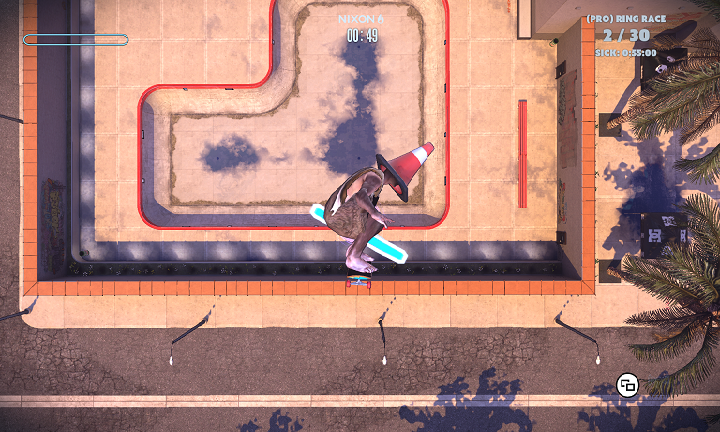 Freestyle Objectives consist of SKATE and COMBO letters, a hidden DVD and Tape and several breakable objects. Missions are a list of mini-challenges, each with a time limit, that reward you with a rank depending on your efficiency. These missions are repetitive as sin; it constantly regurgitates score-based missions, collect-a-thons and tedious trials. By the third or fourth level, it becomes a bore. It feels like the game was designed with no heart or effort, feeling like a pale imitation of older TH games. The level design is also pretty flat. Several feel like mediocre retreads of previous levels, such as School III and Bunker. And other levels just lack any ingenuity and thought. Most don’t utilise moves such as Spine Transfers and though Asteroid Belt has some cool use of zero-gravity, the level-specific power-ups do nothing to add to the game. You can get through the levels in around six hours, and then Pro Missions become available, which again feel flat. In a poor attempt to extend the game, Robomodo have tied progress to each character, meaning you must start over just to change character. You won’t get much interest out of the game beyond ten hours. One of the few positives lies in how THPS5 encourages competition. Rather than a dedicated multiplayer mode, you can enter levels with other players at the same time. You can then invite players to co-op missions, multiplayer duels and just jam with them present. It’s all done through a pretty simple menu system, accessed with the press of a button. It can be problematic, as latency and connection issues can diminish the enjoyment. But none the less, it’s a nice attempt to bring together players without forcing you to abandon your progress. Pro Skater 5 also can feel a touch under produced. The visuals are mediocre, with flat cel-shading, texture pop-in and janky animation. The audio is just as rushed, with a short soundtrack which becomes repetitive quickly, poor sound effects and little to no voicework. 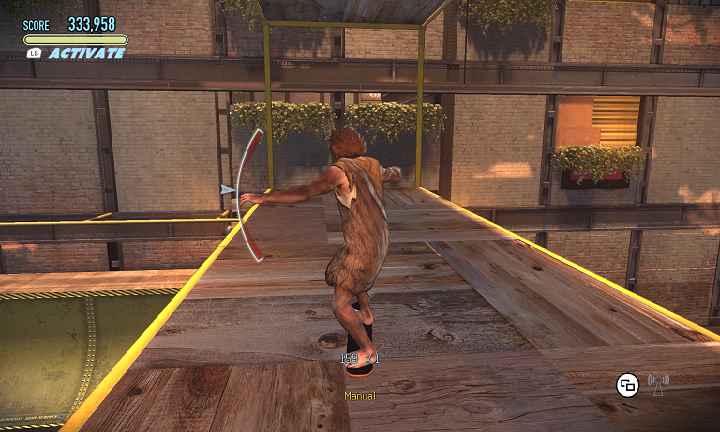 And though not as busted as it was at launch, THPS5 is far from polished. The game crashed on me multiple times, the frame rate was jumpy and when the servers were spotty, the game became jumpy to the point of becoming unplayable. It’s amazing that Activision charged £50 for this game at launch, as its lack of polish and effort would be concerning for a budget game. In terms of 2015 AAA releases, Tony Hawk’s Pro Skater 5 may be the worst. No game, released at a full price, has felt so flat, underdeveloped, half-hearted and disappointing. The series has been on a downward spiral, but to bear the name of the legendary PSone-era games – only to end up worse than the spin-offs – is a bigger kick in the teeth. At least, through free updates, Robomodo are trying to salvage the technical side of the game. But at the end of the day, there is one thing the developer will never be able to patch in: they cannot add heart to the experience. Stick to the originals, as this poor effort will only sour your memories. And with such a poor launch tainting many first impressions, this series may never be able to get back up.